I woke up this morning and Ella was gone. Boy was I scared! I had no idea she could get out of our hotel room by herself, but she is a resourceful elephant. I found a chair near the door. She must have used it to get to the door knob. A glance at the clock told me it was 6:30 a.m. I figured Ella had gone to the lanai to see if there were dolphins. I tossed on my clothes and charged out of the room. I was a bit panicked. I didn’t know if I should worry about somebody kidnapping Ella, or if I should worry more over what kind of havoc she could wreak on the poor unsuspecting hotel staff. I charged from the elevator to the lanai — practically knocking over a half-dozen tourists and a couple of the hotel staff in my attempt to save them from Ella. Imagine my shock and fear when she was no where in site. This is a huge resort complex — and was she even still on the grounds? How was I ever going to find her? Bellowing, “Ella” at the top of my lungs at 6:30 a.m. didn’t seem like a really good idea. Besides, she rarely comes when she’s called. About that time one of the girls from the front desk approached me and asked if I was looking for my elephant friend. 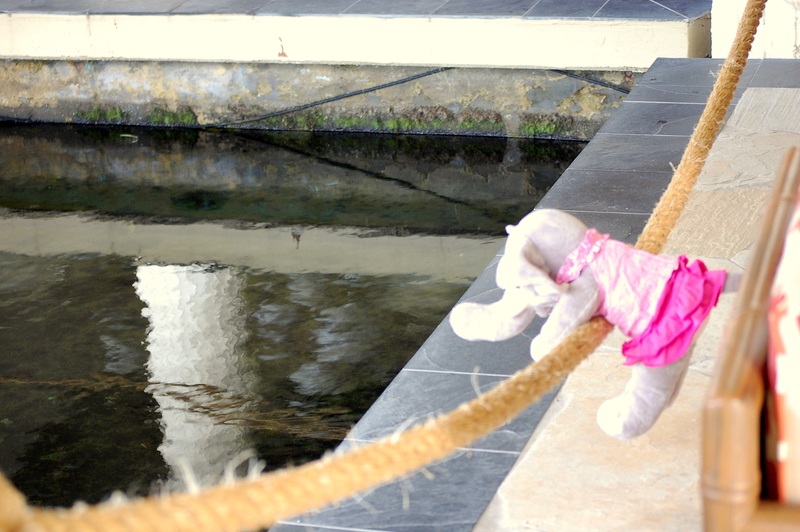 Then she lead me to the Koi pond where I found Ella watching the fish. She said if she couldn’t have dolphins, Koi would just have to do. We will be flying home today. We land in Seattle very late tonight and will be spending a few short hours in an airport hotel before we catch our Kenmore flight back home. Ella and I have lots of vacation pics to share with you, but we think we’ll parse them out through next week. Be seeing you soon! 1st time on ur blog … didn’t really get it – is Ella really an elephent n really went missing … or it’s just a story … btw nice reading ur blog … sounds like u had a great vacation – looking forward to see those pic !! Sharmilla — welcome. I think if you study the photograph in my post, you’ll have the answer to your questions. You are hilarious. Have a safe flight home, and I hope Ella behaves! Linda — Ella and I rented a DigEplayer on the plane and watched Date Night. then we played some video games. She was pretty well behaved. I can’t wait to see the rest of Ella’s adventures. Sounds like you had plenty to keep you busy on vacation between Ella and your man! Logo — we had quite a time. I will enjoy sharing our adventures. Polona — did you notice that she was swinging on the safety rope? Sound reasoning to me. 🙂 Have a safe flight home! Barbara — the flight to Seattle was long but uneventful. We’re back on a charter plane and headed for home at 7:30 tomorrow morning. Beth — our Ella is quite a handful! Who needs kids when you have Ella around! Safe home Quilly, I enjoyed reading this. Thank you for all the reports, good news and bad! 🙂 I think that Ella needs more training and a little harsher discipline from you. If she were my pet I would tell her to remember that she doesn’t have to come along. Going further with some constructive criticism (I learned in Sunday school this morning that criticizing is a GIFT! Did you learn that in your studies? ), tell her about putting her in a drawer and nailing it shut until you get back. Say it’s not a threat but if she runs off or other misdeeds are committed you will do this instead of worrying yourself about where she is or what she will be doing when your back is turned. Oh I’m so glad you found her. She really shouldn’t be wandering about by herself! Have a safe flight home. Hope Ella doesn’t create TOO much trouble on the plane.